I thought I’d continue with the reviews on AHA products, by tackling another common holy grail: The Pixi Glow Tonic Exfoliating Toner. A gentle but effective glycolic acid product, which despite some claims out there does exfoliate the skin. More about that in a bit. Let’s start out by examining the ingredients. 2 Does the Pixi Glow Tonic exfoliate the skin? 4 How to Use the Pixi Glow Tonic. Check out this hot stuff. Aloe vera is an ingredient as old as time, with its skin uses dating back 3,500 years! It has anti-inflammatory, antiseptic, skin lightening, and healing properties. (1 2, 3, 4, 5) A couple studies have also confirmed it’s an effective treatment against psoriasis. (6, 7, 8, 9) I can confirm this. 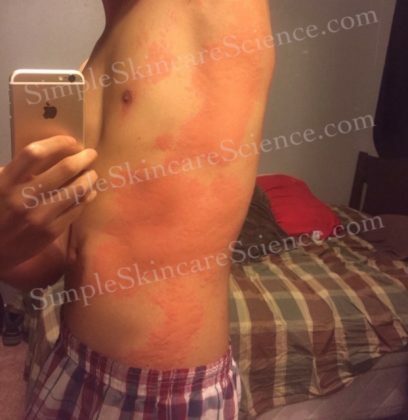 Yes, I’ve dealt with psoriasis in the past, and it blooooows. Here’s what it looks like in case you’re wondering. 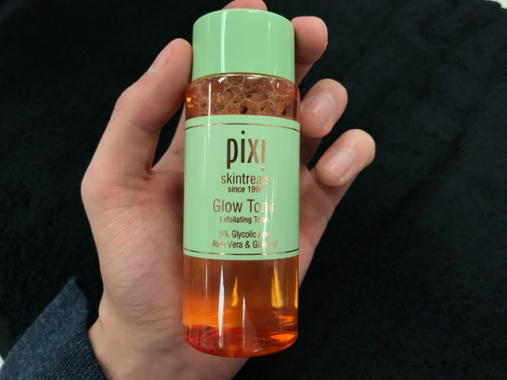 Every time I use the Pixi Glow Tonic I definitely see a reduction in pore size and some pretty drastic skin brightening, which is to be expected when using a glycolic acid product. Funnily enough, I thought I was the only one that noticed, but a friend of mine said I looked “refreshed” about a month after I started using it. He asked me if I had been sleeping more (LOL). Definitely not the case. Soothing ingredient that helps calm rosacea and skin redness. A humectant that draws water from the environment to moisturize the skin. A non-pH-dependent exfoliant and powerful keratolytic agent. (31, 32) Keratolytic, just being the fancy science term for saying it detaches and sloughs off dead skin. Now to answer the question on everyone’s mind…. Does the Pixi Glow Tonic exfoliate the skin? Yes. And don’t underestimate its ability to do so! 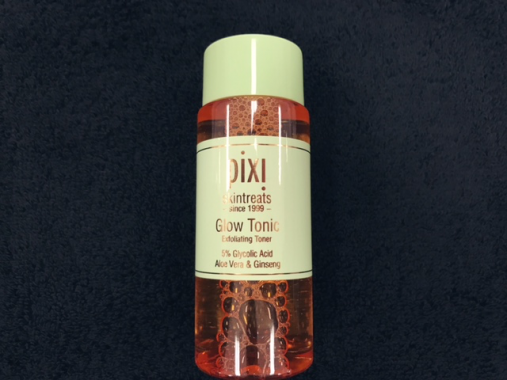 There’s been some confusion thrown around regarding whether the Pixi Glow Tonic is considered a chemical exfoliant or an “acid toner” — in other words, a product simply intended to drop the pH of skin back to a healthy equilibrium after cleansing. The whole controversy started after someone noted that the Pixi Toner’s pH is around 4-5. AHAs, like glycolic acid, require a pH of “4 or lower” to effectively exfoliate the skin. While that is true, it doesn’t capture the whole picture. Let me explain. For example, say we have a 5% salicylic acid product with a pH of 2. That would mean, the entire 5% is “free” to exfoliate the skin. However, when the pH is raised slightly, less of that 5% will actually work. At neutral pH (7), the salicylic acid would essentially be rendered useless as far as chemical exfoliation goes. With that said, the Pixi Glow Tonic has a pH around 4-5, meaning there is still some active acid that will exfoliate. Trust me on this, don’t underestimate this product just because it’s a “weaker exfoliant.” The first time I bought it I stupidly began using it twice daily because I heard it doesn’t exfoliate — BIG MISTAKE. I had glassy over-exfoliated skin within a few days. Keep in mind though, that my skin is fairly sensitive. Just use this bad boy as tolerated and you should definitely see a reduction in skin discoloration, and increased skin brightness (a.k.a. glow). The Pixi Glow Tonic goes on and feels exactly like water. You probably wouldn’t even be able to tell the difference if it weren’t for the scent. It’s so watery I had a hard time trying to get a few drops to sit still as I took a photo. It dries fairly quickly; I’d say it’s completely gone within 2 or 3 minutes. Once it’s evaporated it’s not noticeable on the skin at all, but it definitely leaves it softer and smoother. I’ve found that it layers really well under other products too. Be warned: this bottle is pretty small, so compared to something like Paula’s Choice AHA Gel, it wont last that long. It doesn’t help that it has minimal slip because of its water consistency, meaning it will take more product to spread across the skin. Pro-tip: don’t use cotton balls; they waste product. Simply apply it into the palm of your hands before spreading it across the face. That’s how you’ll get the best bang for your buck. How to Use the Pixi Glow Tonic. Because this is a pH dependent product, the order of it in your routine matters. You want to use it right after cleanser and before other exfoliates, serums, or moisturizers. To give you a better understanding of where to place it, here’s a sample routine taking into consideration many steps. I’m sure not all of these will apply to you, so just make sure to adjust it accordingly. Use the Pixi Glow Tonic here. Low pH serums like ascorbic acid. Wait approximately 25 minutes. Stronger AHAs. Wait approximately 25 minutes. Spot treatments, creams, or other gels like Azelaic Acid or Benzoyl Peroxide. 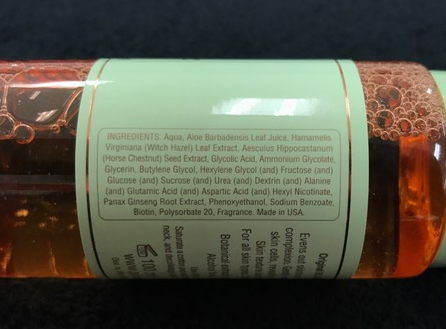 A fantastic and gentle ingredient list that includes aloe vera, witch hazel, 5% glycolic acid, glycerin, fructose, glucose, sucrose, and urea. Exfoliates gently, soothes the skin, brightens skin tone, reduces hyperpigmentation, and provides a little bit of hydration. Feels like water, dries matte, and smells like rosy lipsticks. No real complaints here. I wish the bottle was slighter bigger, but I enjoy it so much I’ll leave the 5 star here. Just a tad too expensive for the amount of product you get, but it’s still on the cheaper side of things so I can’t complain. Just make sure to not use cotton balls (saves product) and it will be worth the price! All in all, a lovely little glycolic acid product, that’s both soothing and mild, and an excellent option for those with sensitive skin in need of some chemical exfoliation. My skin is stupidly sensitive, and I can get away with using this almost daily without irritation. That does it for this review. Hope you’ve enjoyed it! Tell your friends about this Pixi toner magic! thank you for this review- it’s so helpful! i do have a few questions though. when did you start to see results? i have been using this for about a month but honestly don’t notice much of a difference. then again i started using it only twice a week, then every other day. and previously i was using it on a cotton pad so i don’t know if i even had enough product on my face to begin with! if you put it the palm of your hands, as you suggest, how much do you apply? 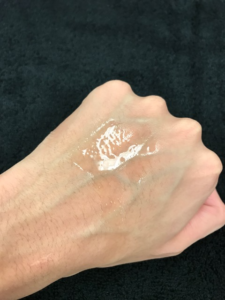 it’s so thin/watery that when i put it in my hands, i was worried that i applied too much product. Just curious, you wrote not to apply it with a cotton ball. 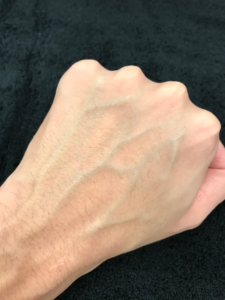 How do you recommend application of this toner? You really clarified a lot with this post. I just bought the toner and was worried. Is it okay to use a lactic acid serum after using the toner? Ops, I just wait 20 minutes between my acids! Am thinking of getting this but i saw it contains Polysorbate 20, which in your fantastic article on fungal acne, this ingredient is bad. Does it worsen in your case? Hi! Can i use pixi toner without serums? My routine are cleansing, toning, and moisturizing. Is it still effective for fading hyperpigmentations? Oh! i forgot i also exfoliate using a scrub twice a week after cleansing. is it just okay? Thanks for writing on this glow tonic, I read reviews on other websites too. It seems a good product to me. You wrote the best article ever. It was so informative and well written. Please continue to do more of these. I just started to use this product and I love it! I bought this product but was disconcerted to find that it includes castor oil. Does this affect the order of applying it? Will the oil reduce the absorption of serums applied over it? I have to start by saying I LOVE YOUR blog! I’ve learned SOOOO much! One thing I would love to ask is – for example, your “sample” routine above – is it okay to use something LIKE pixi glow tonic after cleansing the same night using tretinoin? I love pixi! But recently now being introduced to Benzaclin from my dermatologist for AM and use Tretinoin in the PM – and unsure how I can incorporate! I would love to use PM after cleansing before Tretinoin! I find a hard time finding articles if it is SAFE and okay to do! My evenings i have much more time to wait in between layers too! Hello! Great article 🙂 I had a quick question: I use Differin on Wed/Fri and Cosrx Lightening Serum on Tue/Thu. I was thinking of using this on the days I use the Cosrx Lightening Serum. Do you think this would pose any issue since the Cosrx doesn’t have any AHA/BHA? For clarity, I don’t use any acids on Mon/Sat because I do an acid peel on Sundays. This is the best review I’ve seen for this product! All my questions answered! Thanks! Hi I have combination skin in which my t-zone is oily and u-zone is dry .I wanted to know if this is good for my skin type and if it is do I need an exfoliater after using this ? And how can i use this ? Can you help? Thank you.